Language: English will be the official language of the camp; high proficiency is not required. Accomodation: Volunteers will be hosted in a local mountain hut; sleeping in shared rooms on mattresses on the floor. Please bring your own sleeping bag. WORK/PROJECT: SEEDS volunteers will support this project for the eleventh year in a row, we started cooperation in 2009 and the results have been very positive. The hosts are a group of locals developing the area with alternative tourism services, including running a series of huts in this isolated area in the highlands and offering services to visitors and hikers. In this camp SEEDS volunteers will work on diverse environmental outdoor tasks, including maintenance and development of walking paths and landscaping around the huts in the area. Volunteers will also help with the revegetation in some areas around, clearing litter on the walking paths, and assisting with general maintenance and preparations within the area before summer. As the landscape is raw, the work can be physically demanding and might require a good physical condition. No previous experience is needed. As it is outdoors work, volunteers shall be ready to adapt and be flexible with the working and free-time schedule, as depending on the -changeable- weather, we may not be able to perform some of the tasks or activities planned. Volunteers need to be prepared for working and walking in a wild landscape in one of the most isolated areas in Iceland. Be prepared to experience all kinds of weather and bring warm winter clothes as the tasks take place outside and it can get very cold in the highlands. Bring warm under-layers, waterproofs, walking shoes/boots, a good sleeping bag, hat scarves and gloves. ACCOMMODATION: Volunteers will be hosted in a local mountain hut; sleeping in shared rooms on mattresses on the floor. Please bring your own sleeping bag. The facilities are very basic and volunteers are expected to show consideration for their companions. Volunteers will receive food ingredients and will be in charge of cooking and cleaning. Do not forget some traditional/typical food, drinks, music and recipes from your country for the international evening. 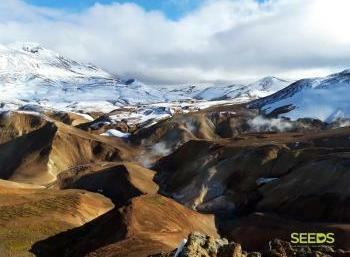 LOCATION: The Icelandic highlands, or “the interior”, are a true pearl to nature lovers and outdoor people. It is accessible on 4WD cars and most routes involve crossing rivers where there are not any bridges. If you really want to get away from it all, the interior of Iceland is like nothing you have ever experienced. The mountainous centre of the island, with its rocky deserts, craggy mountain peaks, ice caps, volcanoes, hidden valleys and hot springs, is an awesome and untouched wilderness. EXTRAS / SPECIAL REMARKS: Participation fee EUR 350 (Euros). Please note that the fee can either be transferred in advance via bank transfer, or paid for on arrival. The fee includes the transportation from Reykjavík to the campsite & back (on the first and last day of the camp). Meeting & Departure time will be at 7:00 in the morning on June 10th. We will return to Reykjavík in the evening of June 24th. Volunteers need to be prepared for physical, demanding work. Weather is unpredictable and it can be very cold or rainy in the highlands. We recommend to bring good walking shoes/boots, warm/winter and/or waterproof clothes (underlayers, overcoats, scarves, gloves and hats) as most of the tasks and activities take place outside.